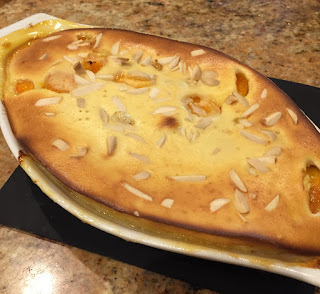 I have been planning to post this recipe for a while (apricots where in season a month or two ago?) because it is so easy to make and just hits the spot for me for dessert -- full of fruit, not too sweet, and a texture that is fun -- halfway between a cake and a custard. It's pretty much the same recipe as the Fig Clafouti I posted a few years ago, one talking about abundance. This recipe is just enough for 2. Well, really it's a lot for 2, but we always manage to eat the whole thing! This is really just a 1/2 recipe of the Fig Clafouti, with a couple of tweaks. To adjust for the apricots, I changed from orange liqueur to Amaretto, because I think almonds and apricots are a good combo. To get fewer dishes dirty, I use the immersion blender instead of the mixer (but you could still use a mixer if you don't have an immersion blender ... or you could even do with a whisk). I have also included weights for ingredients... this further cuts down on dishes as you don't need measuring cups! The baking time is cut down a bit, as this will depends on the thickness as much as the size, as well as your oven, so best go more by how this looks than by time. Figs are back in season, so I will be making the fig version this weekend. In the fall, I'm planning to try with pears. And someday, I will do with cherries... which is the fruit traditionally used for a clafouti! Combine the apricots and liqueur in a small bowl. Add grated zest from ½ the lemon, plus about 1 teaspoon of lemon juice to the apricots. Stir and let sit for an hour or so if you have time. Preheat oven to 350F (or 340F convection bake). Coat a 5-6” diameter baking dish (or something similar) with butter. Pick the apricots out of the bowl (leaving the syrup) and place into prepared pan. Combine the eggs and sugar in cup for immersion blender. Mix with immersion blender until pale yellow, this will take a minute or so. Add milk, flour, salt, and reserved syrup, mix to blend. Pour the batter over the apricots, then sprinkle with almonds. Bake until puffed and golden, 35 - 45 minutes (or 30 minutes on convection bake). 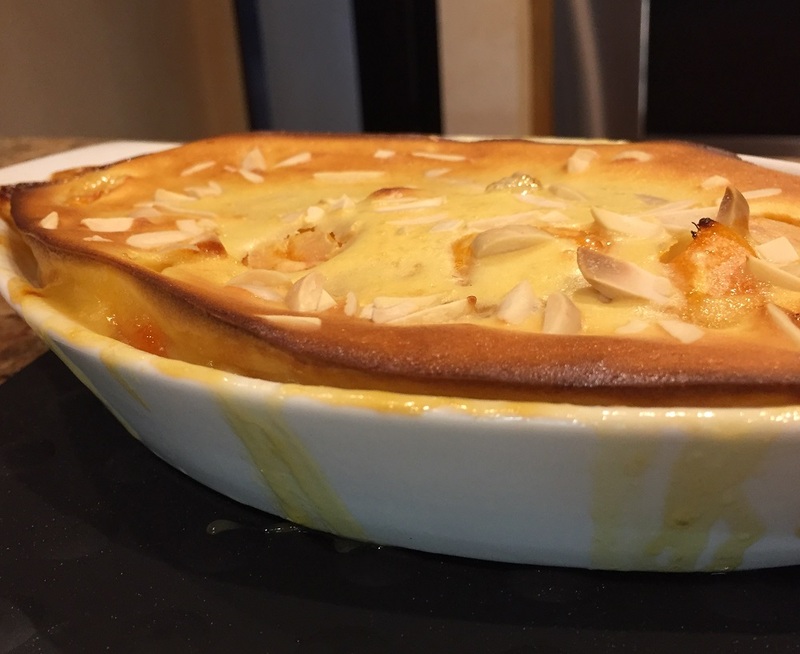 The clafouti should be puffy, browned, and not jiggly. Let cool about 20 minutes to serve warm.